Facebook is undoubtedly the most Popular Social Media Network of all time and we get a lot of Content on the Facebook which is being shared by our Friends, Pages and even leading Brands. There are a lot of Videos which gets uploaded on Facebook Daily. A lot of time it happens when we want to save a Particular Video from Facebook on our Smartphone so that we can watch it offline and can show it to others when we don’t have an Active Internet Connection. However, Facebook does not allow the Users to download any of the Video from Facebook on their Android Smartphone. Recently Most Popular Video-Sharing App, Youtube also rolled out Saving Video Option but Facebook is lagging behind. But we care for you guys, we understand that it is important for you to download that Video on your Android Smartphone so that you can watch it later without even having an Active Internet Connection. So in order to help you guys in this, we are here with our Post on How to Download Facebook Videos on Android for free. You can now download any Video from facebook on your Android Device for free. 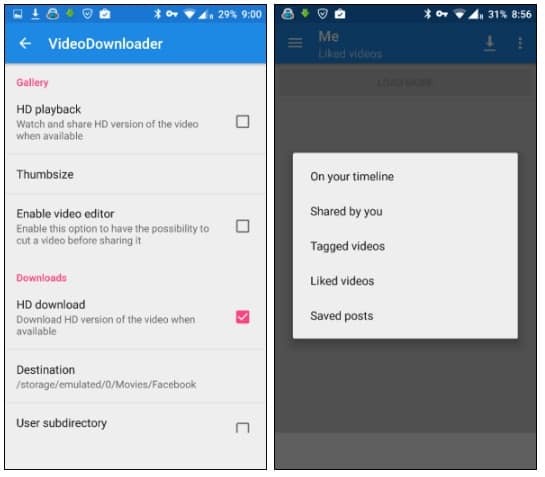 All you need is your Facebook Account, an Android Smartphone, an active Internet Connection and this free App Called MyVideoDownloader for Facebook App. MyVideoDownloader for Facebook App is a free Android App that lets you download any Video from the Facebook for free on your Android Device. This free app enables a user to save a Video on his or her Device so that he or she can watch the Video Later even in the absence of an active Internet Connection. 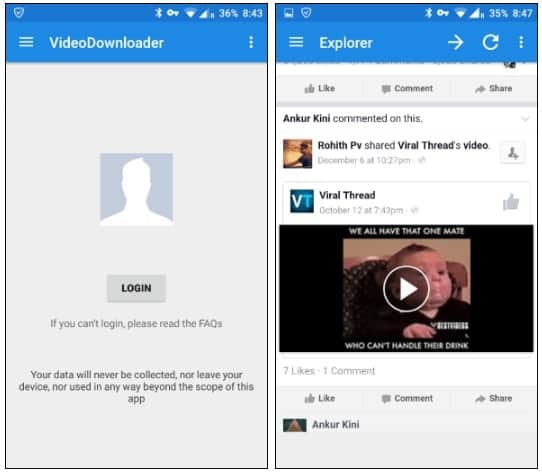 MyVideoDownloader for Facebook App is available to download for Free on the Google Play Store. Download and Install this App on your Android Device from here and then follow the below guide carefully to download Facebook Videos on your Android Smartphone for free. 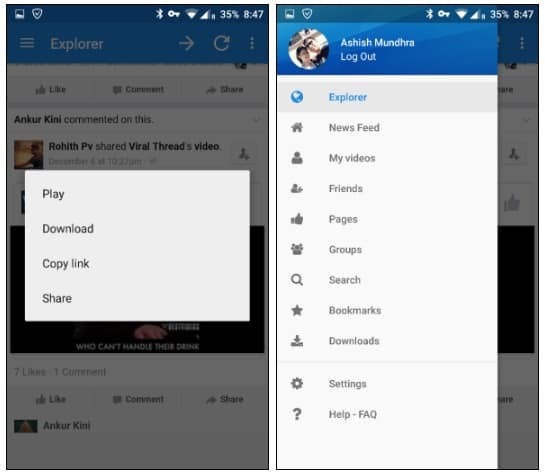 Once the MyVideoDownloader for Facebook App is Installed on your Android Device, open it. Now, you will be asked to log into your Facebook Account, enter your Username and Password for Facebook and Login. Once you have successfully logged in, you will see your News Feed in the App. Now you can navigate to the Video which you want to download.Quick Tip: In case you found the Video in any Group just go in the Groups and then tap on Videos, same goes with Pages and even User Profiles, there is a separate Videos Section for Every User. Now all you need to do is just tap on the Video and you’ll get Options to Play, Download, Share and Copy Link. Just tap on “Download” and your download will start. The app is quite fast but then too it depends majorly on your Internet Service Provider. The download may take some time. There are a lot many things that you can set and change according to your Preferences in the MyVideoDownloader for Facebook App’s Settings like Download Destination Folder, built in Video Editor, HD Playback, and Thumb size which you can play with. MyVideoDownloader for Facebook App is undoubtedly the best App to download Facebook Videos as of now. The App works seamlessly and does the Job very well. You can easily play the downloaded Videos on your Android Smartphone without an active Internet Connection. The Videos can be played with any Player like MX Video Player or even your Stock Video Player. That’s all we know on How to Download Facebook Videos on Android, in case you know any other trick then let us know in the Comments Section down below.